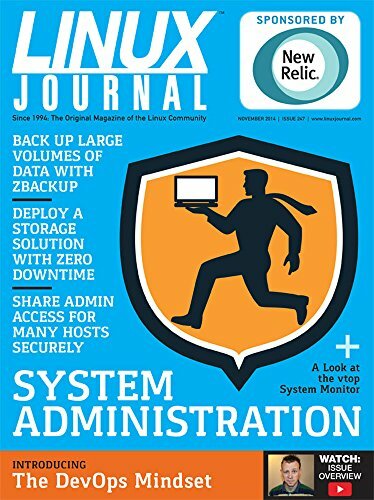 Obtenga el libro de Linux Journal November 2014 (English Edition) de Kyle Rankin en formato PDF o EPUB. Puedes leer cualquier libro en línea o guardarlo en tus dispositivos. Cualquier libro está disponible para descargar sin necesidad de gastar dinero. Every time I write a Bash script or schedule a cron job, I worry about the day I'll star in my very own IT version of a Folger's commercial. Instead of "secretly replacing coffee with Folger's Instant Crystals", however, I worry I'll be replaced by an automation framework and a few crafty FOR loops. If you've ever had nightmares like that, you're in the right place. The truth is, the need for system administrators isn't going down—it's just that our job function is shifting a little. If you stay current, and resolve to be a lifelong learner, system administration is as incredible as it's always been. (And far better than instant coffee! Yuck!) This month, we focus on system administration. It keeps us all relevant, all informed and most important, we should all learn a little something along the way. Reuven M. Lerner starts off the issue discussing the power of NoSQL databases using PostgreSQL. If that seems like a contradiction in terms, you'll want to read his column for more details. Dave Taylor follows up with part two in his series on a script-based dream interpreter. You also will learn a few handy scripting tips along the way that will be useful regardless of the project you're creating. When the series is done, perhaps the dream interpreter can help me figure out my recurring nightmare of being Winnie the Pooh being hunted by angry bees. Or maybe I should just lay off the honey for my tea. Kyle Rankin discusses DNS this month, but instead of setting up DNSSEC, he describes how to set up DNS caches to make your networks more efficient. While Kyle doesn't normally care for dnsmasq as a DNS/DHCP dæmon, in this article, he turns to it for its caching abilities. If you see your internal DNS servers getting hammered, a caching situation might be just what you need. I follow Kyle with an article on DevOps. Although it makes sense to start a series on DevOps tools like Chef, Puppet, Ansible and so on, the first thing to do is understand what DevOps is all about. If you ask six people to define DevOps, you'll get a dozen different answers. This month, I try to clear up any confusion or misconceptions, so that you can benefit from the DevOps idea rather than be scared or confused by it. No system administration issue would be complete without addressing the most important issue facing the sysadmin. No, it's not uptime—it's backups. David Barton walks through using zbackup, which is a deduplicating system for backing up massive amounts of data as efficiently as possible. When a single desktop hard drive can hold 4TB of data or more, the task of backing up becomes monumental. David makes it a little more manageable. Petros Koutoupis follows David with that other topic sysadmins are concerned with: uptime. Migrating data from one system to another often is expensive and time-consuming, and it usually means proprietary SAN storage. With the advent of High-Availability Logical Volume Management (HA-LVM), that same flexibility comes to folks using commodity hardware and open-source tools. Petros explains the concept and process for creating and maintaining highly available LVM solutions for the data center. System administrators know that although central authentication is a key to a successful network infrastructure, there also are local accounts on servers and devices that must be kept local, and yet still used. J.D. Baldwin shows an elegant way to manage those local SSH accounts by leveraging ssh-agent to store authentication keys. If you've ever had to change the password on 100 servers because an employee left the company, you understand the problem. J.D. has an awesome solution. Finally, James Hall describes the process he used when developing the incredibly cool vtop program. A graphical activity monitor for the command line alone is a enough to warrant an article, but James covers his entire process from planning to creating to improving.